My family loved the way this broccoli turned out. Not a floret was left. Don't over cook the broccoli. It should be bright green and crisp-tender. Many people don't like broccoli because it is overcooked and wimpy. See below for some delicious variations. 1. Arrange broccoli in a steamer. Steam, covered, 4 minutes or until crisp-tender. 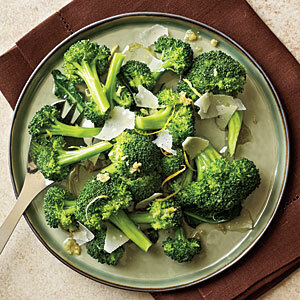 (Do not over-cook) Place broccoli in a large bowl. 2. Heat a small skillet over medium-high heat. Add oil and garlic; cook 2 minutes or until garlic is fragrant. Add oil mixture, rind, juice, and salt to broccoli; toss to coat. Sprinkle broccoli mixture with cheese. Spicy Chile and Garlic variation: Prepare base recipe through step 1. Heat a skillet over medium-high. Add 2 tablespoons olive oil, 1 1/2 teaspoons crushed red pepper, and 4 sliced garlic cloves; cook 2 minutes. Add 1 tablespoon lemon juice. Pour over broccoli. Sprinkle with 1 teaspoon grated lemon rind and 1/4 teaspoon kosher salt. Dijon, Thyme, and Pine Nut variation: Prepare base recipe through step 1. Combine 1 tablespoon minced shallots, 2 tablespoons olive oil, 1 tablespoon fresh lemon juice, 1 tablespoon Dijon mustard, and 2 teaspoons chopped fresh thyme in a bowl; stir with a whisk. Add broccoli and 2 tablespoons toasted pine nuts to oil mixture; toss. Cheddar-Beer Sauce variation: Whisk 1/4 cup beer and 1 1/2 tablespoons flour in a bowl. Combine 3/4 cup fat-free milk and 1/4 cup beer in a pan; bring to a simmer. Stir in flour mixture; bring to a boil. Reduce heat; simmer 2 minutes. Add 3/4 cup reduced-fat cheddar, 1 tablespoon chives, 1/2 teaspoon grated lemon rind, and 1/4 teaspoon kosher salt.